The new “Hero” in the lives of super busy and those who really count just forty winks is “Sleepcation”. Strike off the travel guides that tell you “things-to-do”, “must-see places”, “not to miss eateries” or “top 10 to-do lists”. Try a Sleepcation instead, to actually relax during a vacation and emerge rejuvenated on the other end of the holiday. 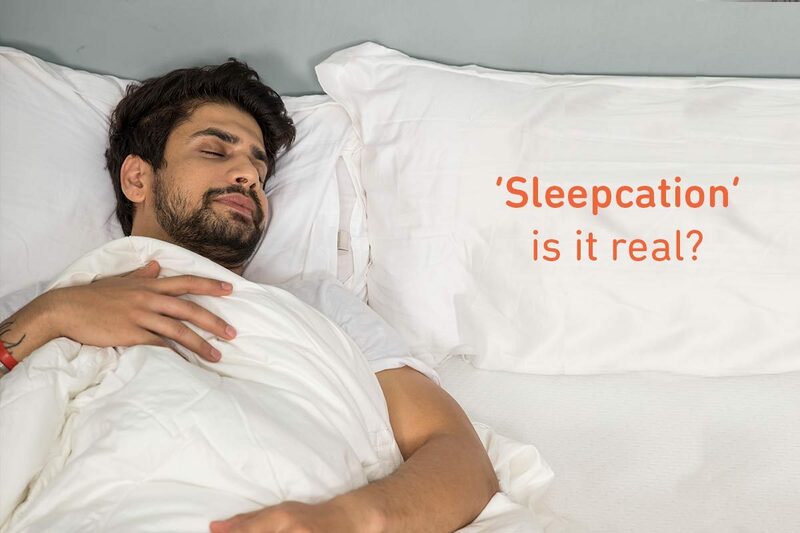 Still wondering what is a Sleepcation? Simple. It’s a holiday dedicated to help you catch up on some sleep. More than 50% of adults are living with “Sleep Debt”, which is the number of hours an average adult should sleep minus the number of hours of sleep he/she actually gets to sleep. Basically, it is the number of hours of lost slumber. A sleepcation is a complete wellness package that aims at helping you sleep better. Choice of pillows: Throw that travel neck pillow out of the window! And try this with your imagination, the hotel staff brings you an array of pillows to choose from, memory foam, sleep apnea pillow and water pillows. Wouldn’t that be sleep-licious? The Benjamin in New York actually offers its guests 10 different pillow choices. Choice of mattress: Now that you have tested your imagination, try this- “what type of mattress would you like in your room sir/ madam, memory foam, orthopedic or a water bed?”, asks the hotel staff. A comfortable and supportive mattress would definitely help you get some good shut eye that your body needs. Spa treatments: A relaxing massage to de-stress those aching muscles and joints followed by some soaking in hot water, is what should be at the top of the agenda of every vacation. Bedtime Bites: Snacks in the bed, sounds like the perfect idea of a holiday. But beware of high-fat snacks that can disturb your sleep. Some hotels have specially curated bedtime menus that could include herbal teas or light bites, so that your system isn’t taxed before sleeping. Yoga or exercise: Don’t even think about ditching exercise on a Sleepcation. Stretch those taut muscles or take part in a guided yoga session, if you have one available easily. All this is a part of the package to help you sleep better and bring the focus back to your neglected body. Sleep expert: None of that worked? Don’t fret! Try a sleep expert or therapist to help you understand the root cause of your sleeplessness and suggest remedies to tackle it. No more screen time. And yes, it does include your smartphone. Powernaps are called so for a reason, don’t ignore them. Get rid of caffeine and alcohol, listen to your mom. Even avoid drinking too much water right before bedtime to avoid waking in the night for a restroom visit. Pack some of these in your bag- noise canceling earmuffs, lullaby music CD and relaxing scent diffusers. So don’t wait and take your overworked and stressed body to a sleepcation! You can thank us later when you feel like a superhero. « What’s the Best (And Worst) Position To Sleep?